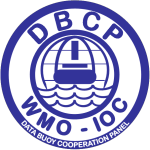 Buoy data is generally available in real time to platform operators via telecommunications providers and very quickly distributed on the Global Telecommunications System of the WMO. Meteo France » provides graphical views of GTS data for 16 days, for active buoys. Canada's Integrated Science Data management » center provides an archive of all buoy data on behalf of the DBCP and JCOMM. Data coming from the GTS is usually available via the ISDM web site within 2 months of observation. The USA National Oceanographic Data center (NODC) » provides an archive of a subset of buoy data and the US National Climate Data Center (NCDC) provides an archive of surface data. Information about data formats is available on under Sharing Your Data. OceanSITES data and metadata ». The DBCP encourages free and open access to data. Real time data sharing is achieved via the Global Telecommunications System of WMO. At present, all of the archiving agencies and many of the operational and research bodies make provision for the release of drifter data to scientific and other customers. In particular, many data are available via the web, either in the form of trackplots or as data sets. In many cases, the policies relating to the release and use of these data are not immediately clear. The Panel is seeking clarification from these agencies, and from its action groups, with a view to developing a coordinated data access policy for drifter data within the letter and the spirit of the WMO data exchange policy defined in WMO Congress Resolution 40 (Cg-XII). Drifter data inserted on the GTS are routinely archived by ISDM, the IODE Responsible National Oceanographic Data Centres (RNODC) for Drifting Buoys. The AOML DAC archives all data from the GDP, and any other drifter data that are made available to it. The Panel and its action groups will actively encourage all buoy operators to forward their data to one or other of these responsible global archives. There has been an increasing demand for instrumental metadata in recent years to serve a number of applications - and climate studies in particular. The DBCP has established its own metadata collection system at JCOMMOPS and is participating in the water temperature metadata Pilot Project (META-T). Quality control procedures are in place to ensure the usefulness of real time data and also of data archives. A well-defined feedback mechanism is required to control real time data. This is described under the DBCP QC Guidelines page. © Copyright JCOMMOPS (excluding photos) | Search | For more information, please contact us.